Next year's presidential election in Afghanistan has been postponed by three months, election authority sources say. About 7,000 troops - roughly half the remaining US military presence in the country - could go home within months, the US media reports said. The decision to postpone the presidential vote also comes after a series of problems affected parliamentary elections in October, which was disrupted by the Taliban and Islamic State group. Violence affected campaigning and the polls themselves, with 10 candidates killed and deadly blasts at polling stations, nearly a third of which were closed because of security concerns. The vote in Ghazni province has not yet taken place because of insecurity and will now happen at the same time as the presidential election. Voting in Kandahar province was delayed for a week after its police chief there was assassinated. There were also problems with a biometric verification system as well as delays at many polling stations because staff arrived late. 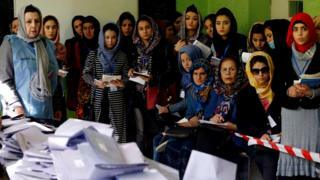 Final results from other major provinces such as Kabul, Herat and Mazar-e-Sharif have not yet been declared. The new parliament is due to begin sitting in March. Past elections in the country have also been marred by corruption, fraud, and voter intimidation. The previous presidential election - which saw Ashraf Ghani take power - was only resolved after a power-sharing agreement was negotiated by the US with Mr Ghani's main rival, Abdullah Abdullah, who was given the position of chief executive.